The cruciform chamber on the summit of Ardloy, a drumlin to the north of the Bricklieve Mountains and Carrowkeel. The neolithic monument is located between two much later enclosures. The view is to the south west and Kesh Corran with its cairn and many caves. 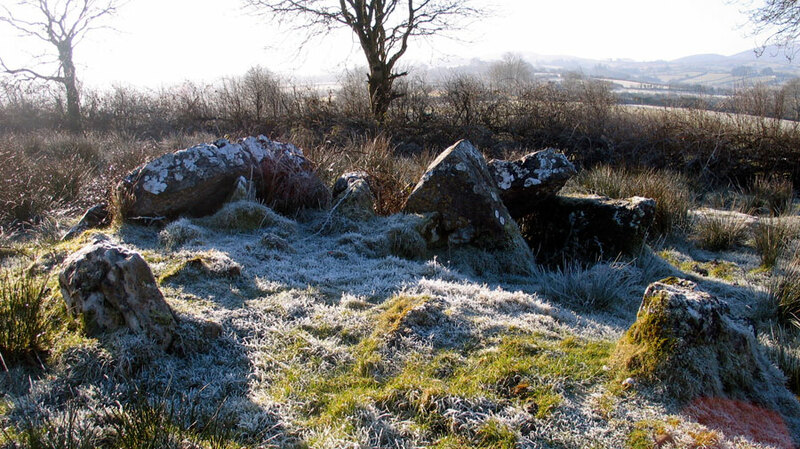 The megalithic chamber at Ardloy is located on a drumlin, 92 m above sea-level and 5 km north of the Carrowkeel complex. The site is pretty ruined, but enough stones remained for the archaeologists from the megalithic survey to establish that the chamber is cruciform in shape. There are fine views to the 21 contempary neolithic cairns on the ridges of the Bricklieves to the south. To judge by the kerbstones still in position, the monument is about 12 meters in diameter. 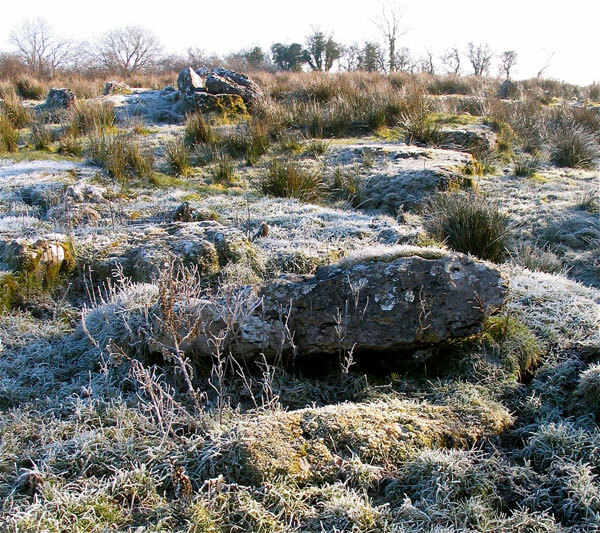 The cross-shaped chamber may have been oriented towards the northwest, the region of midsummer sunsets monitered by the Carrowkeel cairns. Ardloy megalith, looking to the chamber from a displaced kerbstone. The megalith was mined for stones used in the construction of two earthworks, one on either side of the monument to the east and west. These enclosures probably date from the early Christian era, and the western earthwork had a souterrain which was built using slabs from the megalith. A portion of the oval enclosure on the west side of the megalithic chamber at Ardloy. 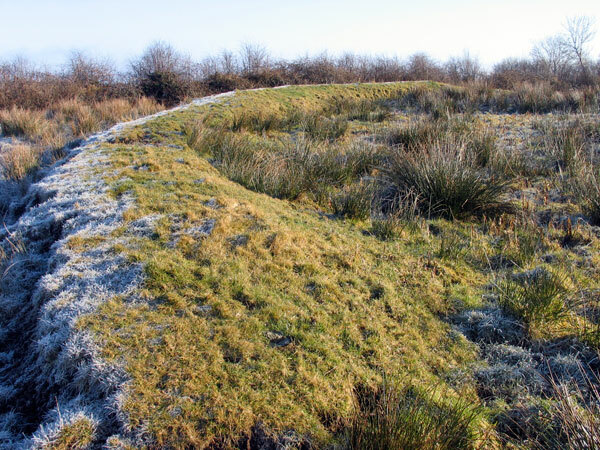 There is a ruined souterrain within this earthwork, built with slabs from the monument. The site is located in a field which is surrounded by high hawthorn hedges, so the view to the cairns in the Bricklieve Mountains to the south, Shee Reevagh to the east, and Knocknarea to the north are obstructed during the summer when the hawthorn is in bloom. The cruciform chamber at Ardloy. The view is south towards Carrowkeel a few kilometers away, but the morning was too hazy to see the mountain.